I’m convinced that the quality of our lives is greatly determined by the questions we ask ourselves. Without asking questions, there can be no awareness of ourselves. A few days ago, I was at a workshop, where we were asked to answer the question: ‘Who are you?’ That’s a fantastic question to start with. How you describe yourself, your beliefs, your life, your work will reveal to you some great insights about yourself. Asking questions is what keeps us from becoming stagnant. Without questions there can be no growth. Apparently when eagles build their nests, they make a foundation out of rough twigs and branches with thorns. Then they add soft leaves to make the dwelling comfortable for the chicks. As they grow, the chicks thrash about and scatter the soft leaves. The thorns then begin to make them uncomfortable. This is what motivates them to start taking flight and move out. The best part about asking yourself questions is that you’ll find that you have the inner wisdom to answer them. Take a day off for yourself to reflect on these questions. Come back to them after a month and see if they make sense to you. Ask the questions again. 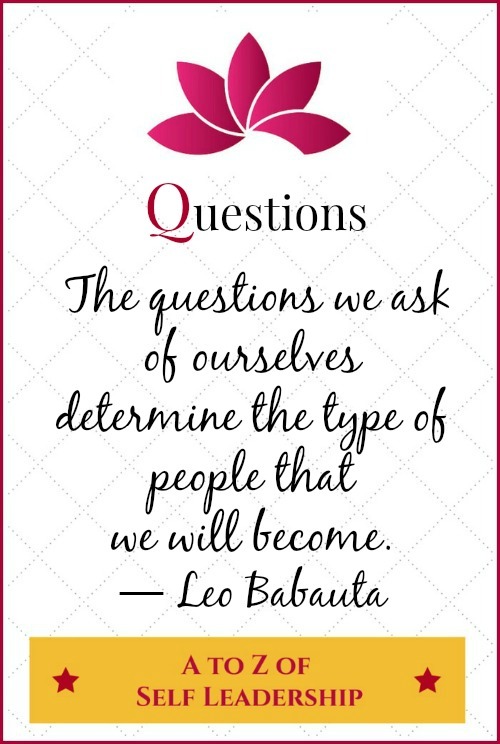 The questions we ask ourselves determine the type of people that we will become. Today I’m on ‘Q’ of the Blogging from A to Z April Challenge. My theme is the A to Z of Self Leadership. That was such a great read..well said and you are so right. Unless we question our very existence, we wont be able to challenge ourselves to do better with our lives. These are very good questions that we should all ask ourselves, because they will help us to redirect our lives if need be. Thank you.